A lifelike statue of Mr Nelson Mandela, his arms outstretched, was unveiled today in Parliament Square in central London, to stand as testimony of the triumph of freedom and humanity over oppression. Mr Mandela and his wife, Mrs Graça Machel, witnessed the unveiling of the bronze statue, which is slightly larger than life size, and was sculpted by the late Ian Walters. The unveiling concluded a seven-year campaign led by the Mayor of London, Ken Livingstone, Wendy Woods – widow of anti-apartheid campaigner, Donald Woods – and film director, Lord Richard Attenborough. Mr Livingstone declared: “Mr Mandela, there can be no more fitting place than this square, which you will share with the American president who freed the slaves, Abraham Lincoln, and the British prime minister, Winston Churchill, who led a nation standing alone against the greatest evil of the 20th Century,” said Livingstone. 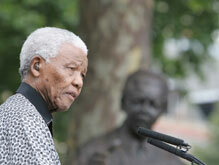 He also thanked everyone who made it possible for the statue to be erected in London. He said, “We are humbled by your choosing to honour us in this way. From the moment Donald Woods initiated the project to when Ian Walters came to my home in Qunu to begin the statue, we never dreamed we would all be here today. “It remains for me to acknowledge my gratitude to all who have made this day possible. We trust that the statue will be a reminder of heroes and heroines past, as well as an inspiration for continuing struggles against injustice,” Mr Mandela added. Firstly, please allow me to congratulate our friend Gordon Brown on his new position as Prime Minister of Britain. We are confident that his leadership will not only reinforce Britain’s position on the world stage, but serve the British people and the world at large with distinction. Gordon, we wish you strength and great wisdom for your term in office. We are humbled by your choosing to honour us in this way. From the moment Donald Woods initiated the project to when Ian Walters came to my home in Qunu to begin the statue, we never dreamed we would all be here today. Though this statue is of one man, it should in actual fact symbolize all those who have resisted oppression, especially in my country. The history of struggle in South Africa is rich with the stories of heroes and heroines, some of them leaders, some of them followers. All of them deserve to be remembered. When Oliver Tambo and I visited Westminster Abbey and Parliament Square in 1962, we half-joked that we hoped that one day a statue of a black person would be erected here alongside General Smuts. Oliver would have been proud today. We thank the British people once again for their relentless efforts in supporting us during the dark years. We remember the “Free Mandela campaign” and the time we gathered in 1990 at Wembley Stadium following our release from prison. We are proud to announce that in celebration of my 90th birthday next year, my international Aids campaign, called four double six six four, will once again call on you as a British nation to gather. On the 27th of June 2008, four double six six four will host a concert in Hyde Park. I want very much to be back in London to attend this concert, and I hope to see you there. It remains for me to acknowledge my gratitude to all who have made this day possible. We trust that the statue will be a reminder of heroes and heroines past, as well as an inspiration for continuing struggles against injustice.